A zoo is a place or establishment where wild animals are kept securely for conservation, display to the public or even for research purposes. It can also serve as a major tourist attraction centre that helps boosts the tourism sector of the country. In Nigeria, the locations of the different zoos in the country are spread in various states of the Federation. Some of these animal zoos in Nigeria include: Jos Wildlife Park, Kano Zoo, Nekede Zoo, Enugu Zoo, Ibadan University Zoo, Abuja Children’s Zoo, The Port Harcourt Zoo, etc. In this post we shall list all popular zoos in Nigeria and their locations plus the animals that exist in these wildlife conservation centres. Also known as the Gidan zoo, this wildlife conservation centre is located in Kano state. It is one of the best animal zoos in Nigeria opened to the public. It was named after the former military governor Audu Bako. In terms of size, the zoo land area covers 46 hectares and it has the following animals in its care: Lions, Zebras, Elephants, Antelopes, Goats, Camels, Ostrich, Giraffes, Hippopotamus, etc. The number of these animals are over 150. Managed by Kano State Zoological & Wildlife Management (KAZOWMA), the Audu Bako Zoological and Botanical garden is open to visitors from different parts of the country from 9am to 6pm. Adults pay an entry fee of ₦100 while ₦50 for children. 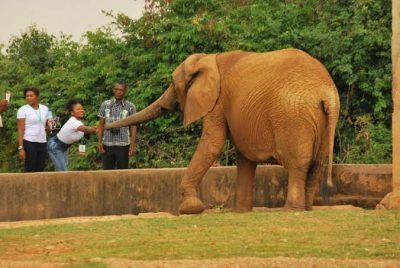 The location of the National Children’s Park and Zoo is in Asokoro District of Abuja (FCT) and this animal zoo is safe to visit if you have a family or a loved one you would want to take for outing. The large area in the park is wide enough for children especially where the playground is situated. The cafe within the zoo makes it easy for parents and visitors to buy snacks and drinks for themselves while they walk around the zoo premises. The National Children’s park and zoo management deemed it fit to tag the cages where the animals are kept for easy identification. Some animals within the zoo include: ostriches, giraffe, camels, donkeys, lion and even cheetah. The gate fee for adults at the entrance of the National Children’s park and zoo is ₦200 while ₦100 is collected for kids. This animal zoo is open to the public from 9am to 6pm daily. The Jos Wildlife park is one of the popular animal zoos in the country located along Miango road in Jos, Plateau state. Also known as Jesse Aruku Wildlife Park, you can find various animals such as Monkeys, Buffalo, Varieties of birds, Elephants, Chimpanzees, Crocodiles, etc. This state of the art zoological garden is very beautiful and has a museum where animal artefacts are displayed to the public. The presence of the picnic spots inside the zoo area makes it a good place for relaxation. Ogba zoo location is in Edo state and it is a forest reserve area covering over 20 hectares of land. Within its vicinity is the presence of refreshment and picnic centres, a car park large enough to park many cars, event hall and even playgrounds for recreational functions. The wide variety of animals in Ogba zoo include different kinds of snakes, python, tortoise, hyena, peafowls, turkey, horses, etc. LCC is one of the best and largest zoos in Nigeria covering a 78 hectare land area in Lagos state. The centre was built by Chevron Corporation for education and research purposes. The company also provides funding annually for the wildlife conservation centre upkeep. With natural species in the country going extinct to urbanization, the need to protect and preserve wildlife, aquatic specimens and forest in its natural form arose and that’s why the Lekki Conservation centre which is located at Lekki-Epe Expressway, just opposite Chevron was constructed. As a side attraction well managed, its expansive marshland and rich savannah grassland plus its aquatic view is a joy to behold. The LCC also has children playground, picnic centres, amusement park, a modern view where various bird species, crocodiles, squirrels, ducks, and other reptiles can be seen. It is also an expensive animal zoo in terms of gate fee and price, having the longest canopy walkway in the African continent. Another animal zoo worthy of visiting in Nigeria is the Omu Resort which is located at Ibeju Lekki in Lagos. This resort is very serene and beautiful as you behold the works and wonders mother nature. Facilities such as the wax museum, mini-golf course centre, zoo, amusement parks, eateries and so much more are all within the premises of the resort. PH Zoo as it is popularly called is located in Obio-Akpor LGA of Rivers state. It was established in 1974 and it is a zoo opened to the public. It is also one of Nigeria’s major attraction site and conservation centres. You can also find various animal specie in this zoological park.